Happy Mother's Day to all my wonderful stamping mommies out there! I thought this card was fitting for today. I was commissioned to make some Mother's Day cards and this was one idea I came up with. 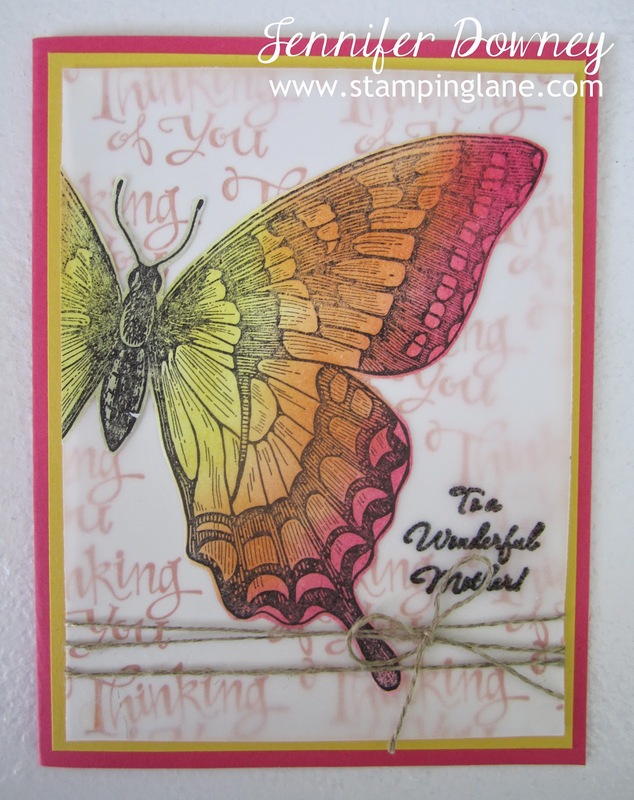 Using Strawberry Slush ink, I stamped "Thinking of you" from the Sassy Salutations set on Whisper White card stock then attached a piece of our Vellum card stock over top to mute it slightly. Using Basic Black ink, I stamped the large Swallowtail butterfly and cut it out. Then using sponge daubers inked it up with Strawberry Slush, Pumpkin Pie, Daffodil Delight and Crumb Cake ink. I adhered it on top of the vellum. I embossed the words on the vellum and then wrapped it all up with linen thread. Hope you are having a wonderful and love filled day - YOU DESERVE IT! Happy Stamping!